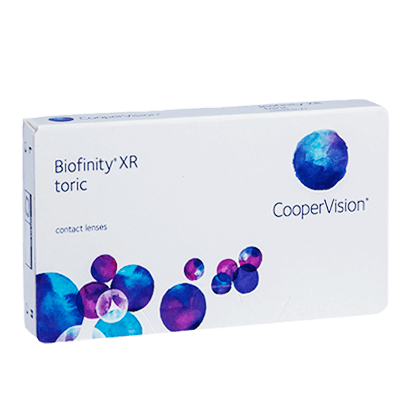 Available with an extended range of toric prescriptions, Biofinity XR Toric contact lenses offer outstanding visual correction for astigmatism. Enjoy toric contact lenses built by manufacturers CooperVision to offer clear and consistent vision, alongside a comfortable wear. Made from silicone hydrogel, these monthly contact lenses for astigmatism deliver stable and balanced vision all day long due to their advanced design that remains in place on the eye during movement. As silicone hydrogel contact lenses, they also permit a welcome supply of oxygen to flow through the lens, refreshing your eyes consistently over the course of the day. 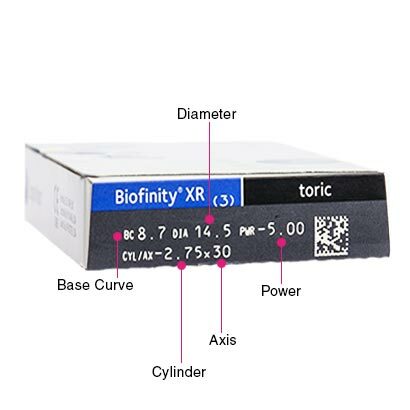 As a result, you’ll enjoy fresher and healthier eyes when you wear Biofinity XR Toric contacts. Aquaform Technology also accounts for a smooth, wettable and comfortable fit, that you’ll barely feel even as the day goes on. By locking in water molecules, these Biofinity contact lenses are able to keep eyes hydrated from morning till night, standing up to the demands of even the most trying day and preventing the onset of dry eye. 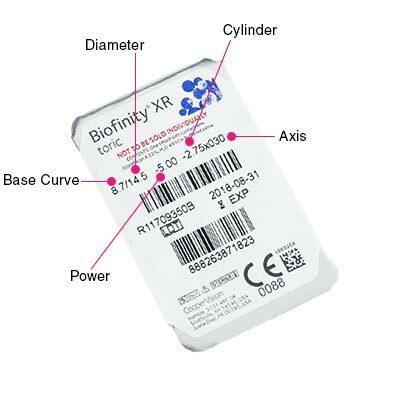 Biofinity XR Toric contact lenses are monthly disposable lenses, designed to be removed nightly and stored in contact lens solution overnight. With this type of wear, you can enjoy clean and comfortable contact lenses for up to 30 days. However, if approved by an eye care practitioner, you can alternatively wear them as extended wear contact lenses. This allows you to wear these toric contact lenses daily and nightly for up to a week, without needing to remove them before sleeping. When worn as monthly contact lenses, you can maintain their quality and hygiene by making use of a contact lens solution for cleaning and storing them. We recommend our best-selling comfi All-in-One Solution for all your lens care needs. Really pleased with these lenses. They are so much more comfortable than the pro clear lenses and they do not rotate around my eyes so much which required several adjustments every day. The only minor issue is that they are a bit more difficult to take out but I cab live with that! These lens are exactly like my original prescription from Specsavers. They are a comfortable fit, and quite a bit cheaper. Crisp, clear, stable, comfortable vision. Fantastic!